The most convenient way to install the distribution is to use the GNU-Darwin Office cd for ppc and x86. You can order them or download and burn the images. These are NOT bootable cds, they install the distribution (over 250 applications and libraries) on an existing Darwin system. Requires either Darwin 7 or 8, or MacOS 10.3 or 10.4. 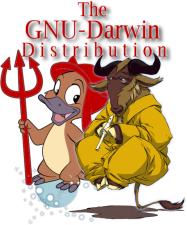 GNU-Darwin-OSF1 for Tru64 Alphas and GNU/Linux is also now in alpha distribution. There is more info about this development on the Science page .